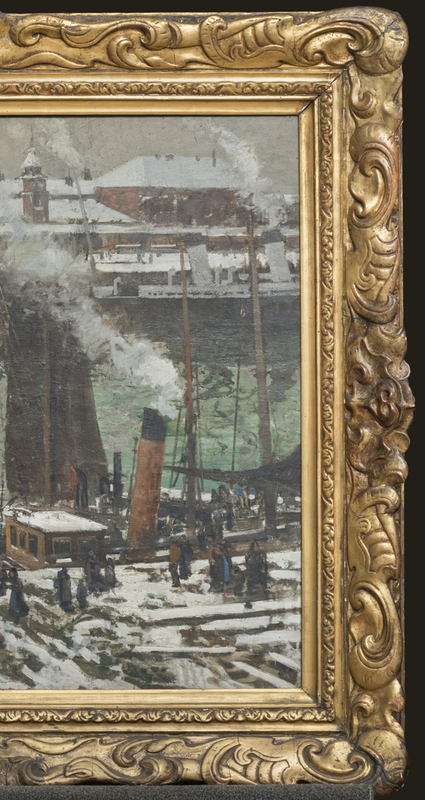 James Church, the great-grandson of Walter Elmer Schofield, discusses the frames made between 1905 and 1911 for this American Impressionist by the London framemaker, H.W. Taylor, in the light of their correspondence. 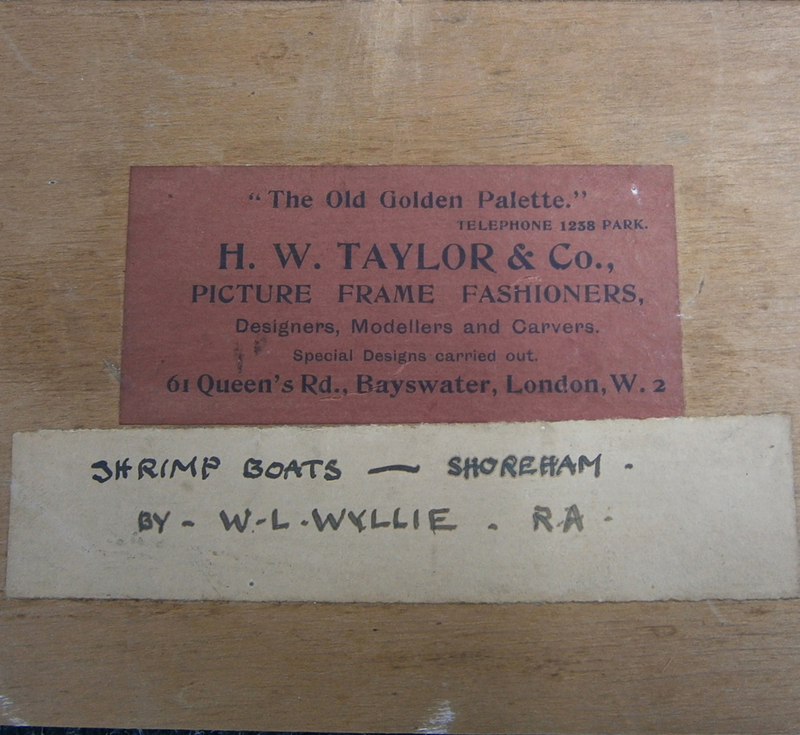 Harry Walter Taylor (1864‐1934) set up his frame‐making business, H.W. Taylor & Co., in 1896, located at ‘The Old Golden Palette’ in Bayswater by 1900. W. Elmer Schofield (1865-1944), an American artist, was a patron in the early years of the company and appears first to have turned to Taylor for framing his canvases in 1905. Schofield was a highly regarded landscape painter, who first came to prominence through depicting his native state of Pennsylvania under snow in the late 1890s; his fame in depicting the winter landscape of Pennsylvania and New England remained, despite the variety of his subsequent work. The award of a Silver Medal from the Louisiana Purchase Exposition and the Gold Medal of the First Class from the Carnegie Institute in 1904 established his reputation as a significant American artist of the early 20th century. His work is held by many of the major art museums of the United States, including the Art Institute of Chicago, the Smithsonian American Art Museum and the Metropolitan Museum of Art, as well as by the Musée d’Orsay in Paris. Schofield’s marriage to Muriel Redmayne in 1896 (she came from Southport in Lancashire), and his discovery of Cornwall in 1903 ensured that he spent extended periods of time in Great Britain. His collaboration with Taylor lasted until about 1911, when Schofield began to use the hand‐carved frames of the Newcomb‐Macklin Co. of Chicago and New York. 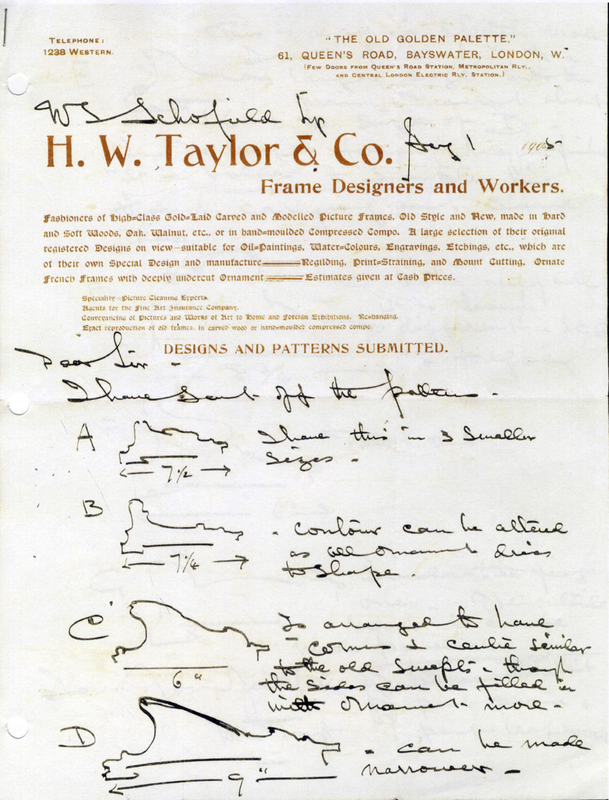 The chance survival of early correspondence both from Taylor, detailing potential designs and handwritten on his company letterhead, and Schofield, in the form of a draft response to Taylor’s proposals, offer an unusually complete glimpse in to the relationship between frame maker and artist. 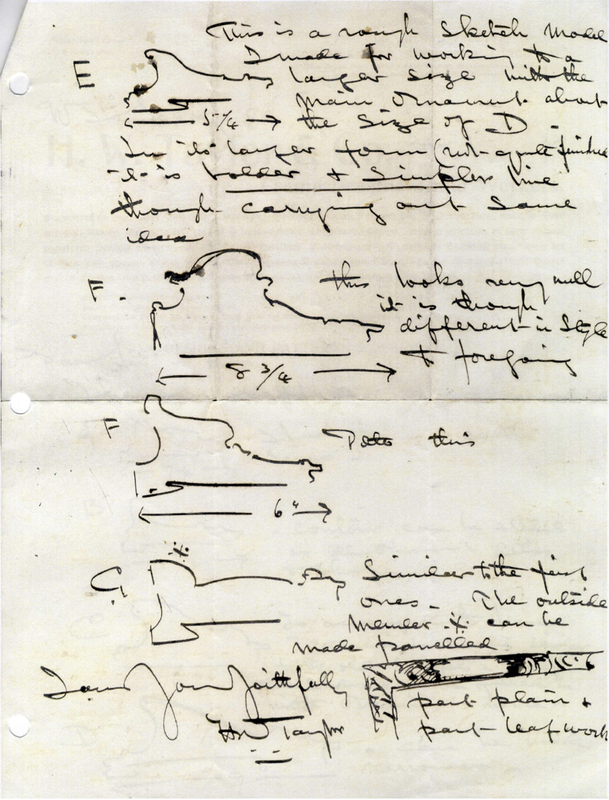 This correspondence is transcribed in full below together with the information currently available from those of Schofield’s paintings which retain Taylor’s frames, and from other archival sources. Fashioners of High=Class Gold=Laid Carved and Modelled Picture Frames. Old Style and New, made in Hard and Soft Woods, Oak, Walnut, etc., or in hand=moulded Compressed Compo. A large selection of their original registered Designs on view ‐ suitable for Oil=Paintings, Water=Colours, Engravings, Etchings etc., which are of their own Special Design and manufacture ‐‐‐‐‐ Regilding, Print=Straining, and Mount Cutting. 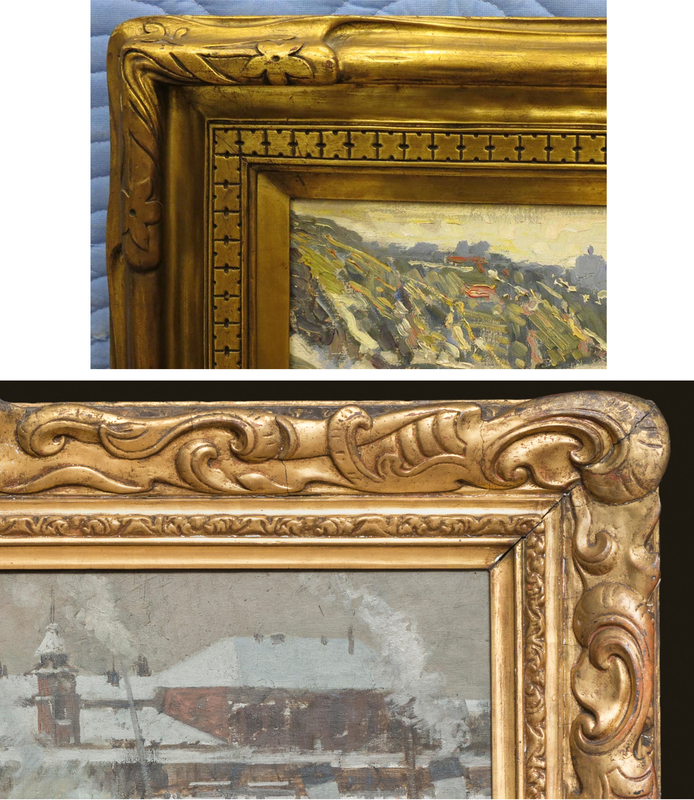 Ornate French Frames with deeply undercut Ornament —– Estimates given at Cash prices. Conveyancing of Pictures and Works of Art to Home and Foreign Exhibitions. Re=Hanging. Exact Reproduction of Old Frames. In carved wood or hand=moulded compressed compo. I have sent off the patterns. A. [sketch] 7 ½ I have this in 3 smaller sizes. B. [sketch] 7 ¼ Contour can be altered as all ornament dries to shape. C. [sketch] 6″ Is arranged to have corners & centre similar to the old swepts, though the sides can be filled in with ornament more. D. [sketch] 9″ Can be made narrower. E. [sketch] 5 ¼ This is a rough sketch model I made for working to a larger size with the main ornament about the size of D. In its larger form (not quite finished) it is bolder & simpler line though carrying out same idea. F. [sketch] 8 ¾ this looks very well it is though different in style to foregoing. F. [sketch] 6″ Ditto this. G [sketch].x. Similar to the first ones. The outside member .x. can be made panelled [sketch] part plain & part leaf work. ‘The pattern marked E made up into a 7 in frame with a simpler form and the ornament handled a little more – not so sharply defined – a little simpler and the corner and centre pieces not too bold – the pattern marked A if you could handle this ornament so that it was not quite such high relief, that is I mean pressed down a little more and with some appropriate centre + corner design. ‐ As to the colour of the frames – I want them in bronze and very low in tone – give them quite an old look] I want the design in both frames to be “melted” into the background so that it will lack sharpness everywhere and with the handling you know so well how to do. I trust you understand perfectly what I desire – if not please write and I will try to make my meaning plainer – Do not make main ornament in E the size of D as you suggest but a bit smaller as I do not wish it too bold. 61, Queen’s Road, Bayswater, London, W.
Although probably begun or even completed during Schofield’s visit to Boulogne the previous year, The landing stage, Boulogne was perhaps reworked over the course of 1909; what appears to be a date of ‘09’ appears next to the artist’s signature in early reproductions, but this is no longer discernible. The landing stage, Boulogne is first recorded as being exhibited at the 105th Annual Exhibition of American Painters, Pennsylvania Academy of the Fine Arts, which ran from 23 January to 20 March 1910, suggesting that this Taylor frame is possibly one of those shipped to Paris. Despite its being likely that a number of frames from Taylor’s workshop graced Schofield’s exhibition pieces, few remain with the canvases for which they were made. 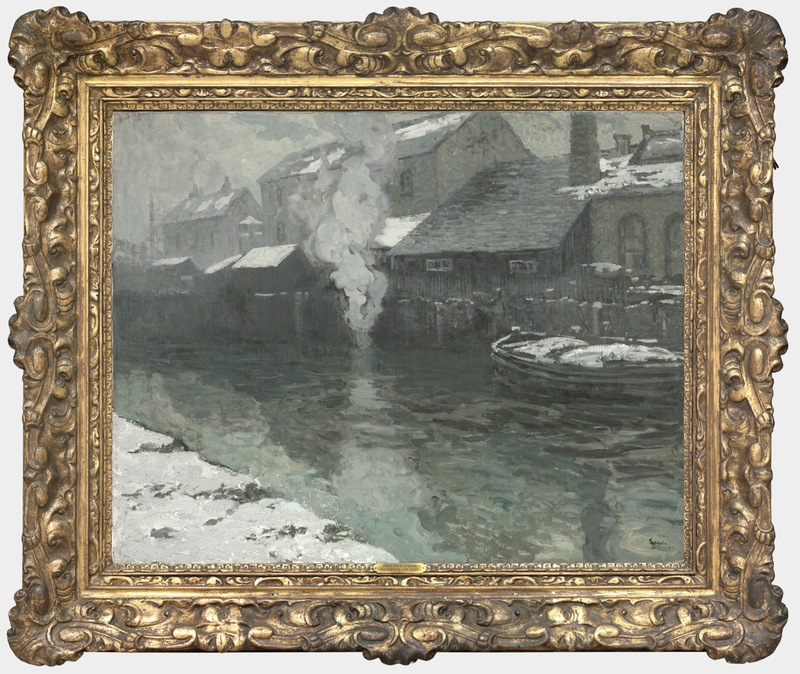 None are known from major canvases from 1905 or 1906, with the earliest known Taylor frame (attributable on stylistic grounds) being that used for Winter in Picardy (1907, Philadelphia Museum of Art). 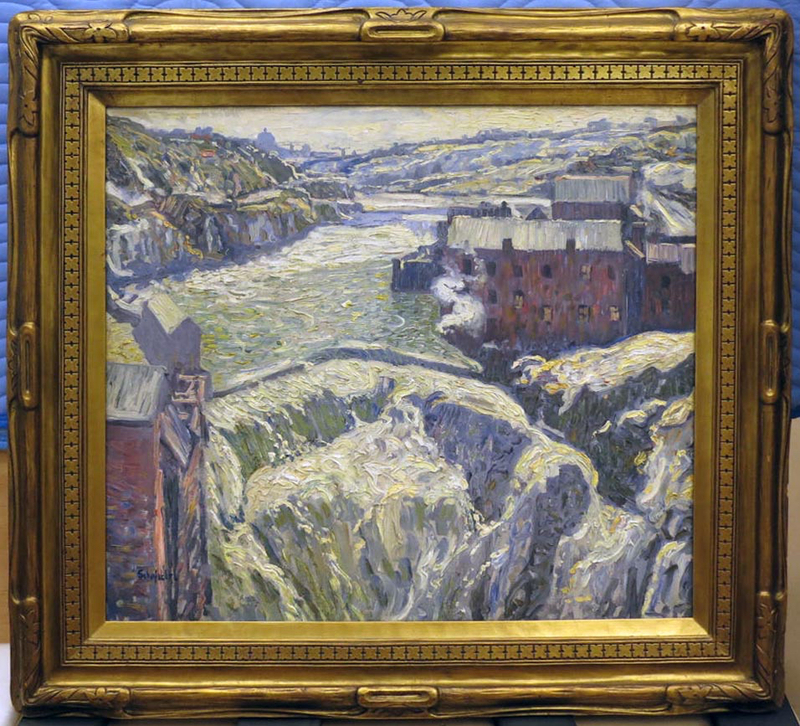 This is one of Schofield’s most important paintings from before the Great War, and was acquired by the noted Philadelphia collector, Dr George Woodward, while on display at the Pennsylvania Academy in 1908 . It wasn’t, initially at least, housed in a Taylor frame. 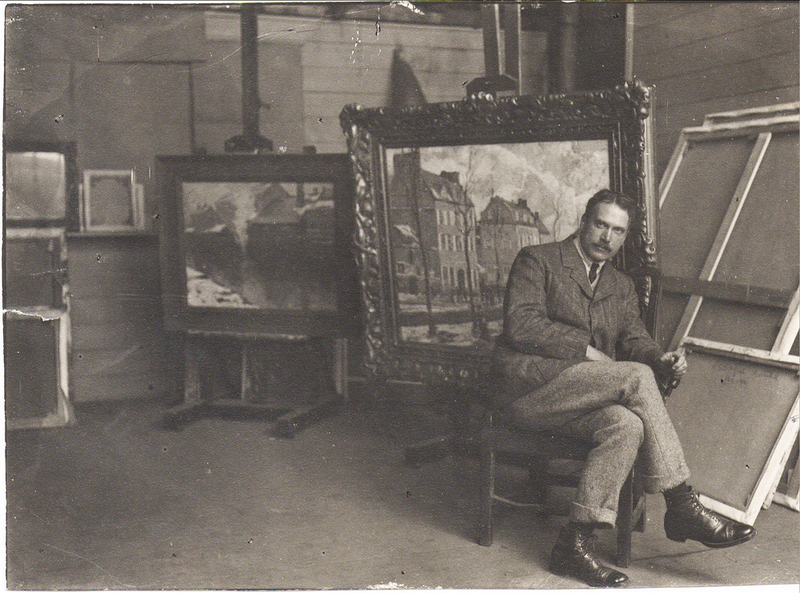 In a photographic portrait of Schofield in his St Ives studio, taken by his friend W.H. 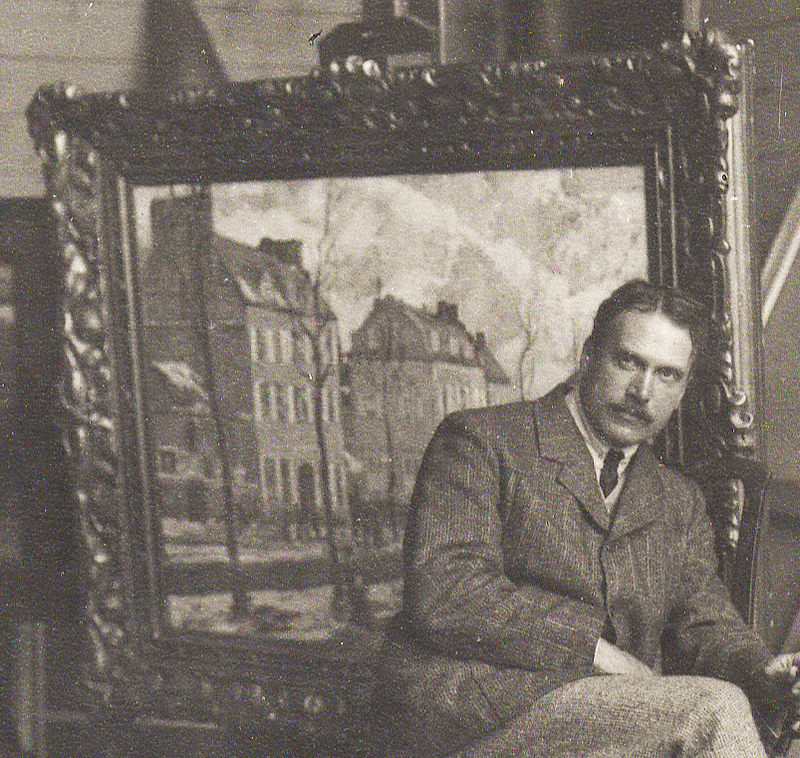 Lanyon in 1907, Winter in Picardy is visible to the left in the background, framed in a simple architrave profile. These simpler, and therefore less expensive, frames were perhaps used by Schofield in some numbers, even for major exhibition canvases. Old mills on the Somme (Indianapolis Museum of Art) and Old covered bridge (Rockford Art Museum), acquired respectively in 1909 and 1913, are also housed in plain frames without ornament and may be the artist’s own selection. Like that on The landing stage: Boulogne, this frame is based on historic patterns; it combines a Baroque silhouette with small Auricular motifs, and demonstrates Schofield’s preference voiced to Taylor to have ‘the corner and centre pieces not too bold’. It is more restrained than the frame made for Schofield a mere two years later for the later work. 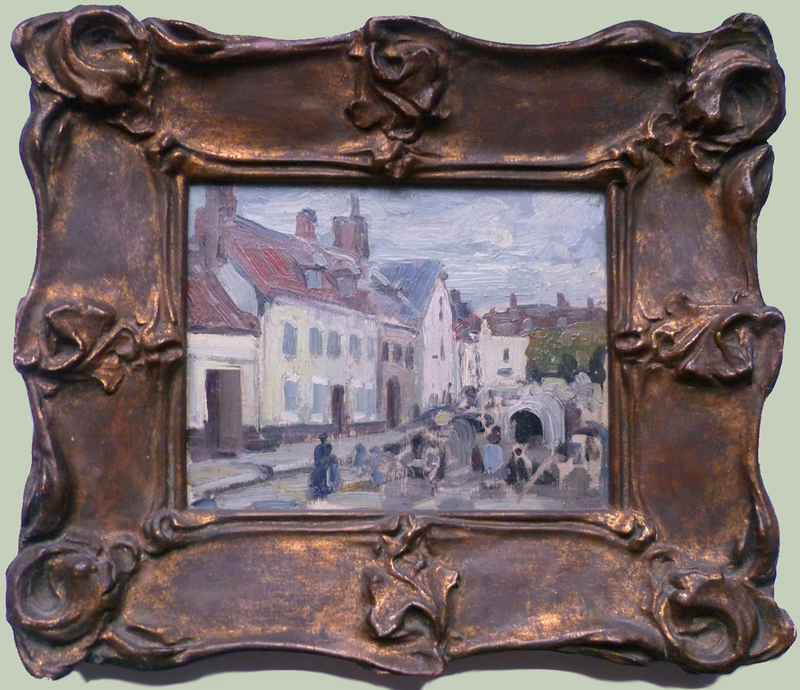 The style of the frame enclosing this oil study does not follow antique models, in contrast to the other two examples, but is strongly influenced by modern Art Nouveau motifs. Judging by the surviving records, it does not appear at all likely that Schofield exhibited his smallest studies. As Muriel appears to have visited H.W. Taylor & Co. to give them instructions, it is a plausible suggestion that Montreuil-sur-Mer, the market came to be framed by Taylor as a personal order, either for Schofield himself or on Muriel’s own initiative, to enable it to be hung in the artist’s home. This hypothesis is supported by the fact that this painting remained in the collection of the artist’s family until 2006 . The stylistic difference that this frame represents does suggest that Schofield’s choices varied according to the destination of the painting, and that Taylor produced different designs for Schofield’s personal, rather than exhibition, use. We must also be careful in assuming that all of Taylor’s work for Schofield was under the artist’s absolute direction, since an equally plausible explanation is that Muriel herself may have chosen this frame; an explanation that is, perhaps, the more interesting in its implications. Indeed in its current state this frame has lost both upper and lower centre cartouches, the compo being completely broken away to reveal the timber carcase below. These frames were fundamentally fragile, as well as exceptionally heavy. 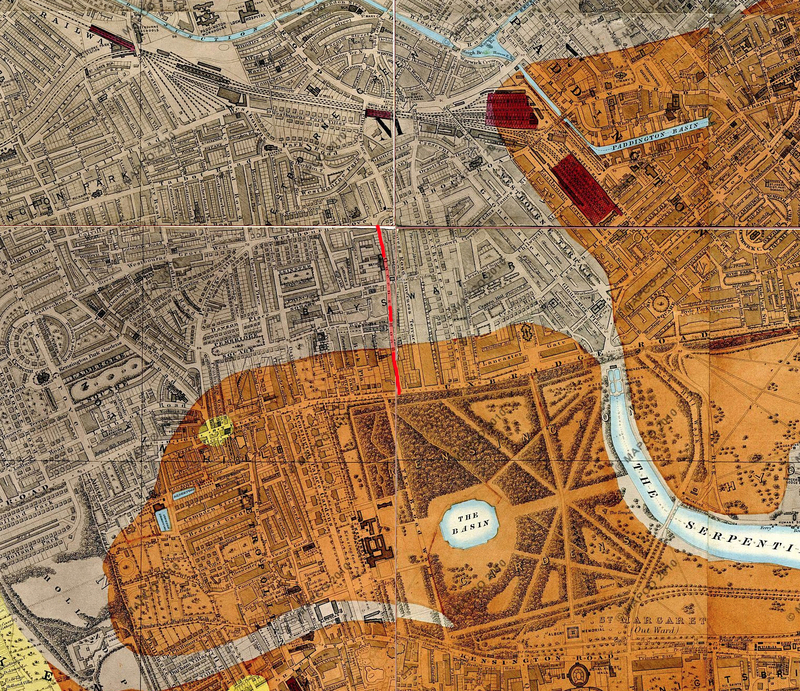 James Church has a BSc and MArch in architecture from the Bartlett School of Architecture, UCL, and an MA in the History of Art from Birkbeck College (University of London). He lives in London and is currently working in an architects’ office; he also draws and writes. W. Elmer Schofield is his great-grandfather, and he is currently researching Schofield’s period in St. Ives from 1903-07. 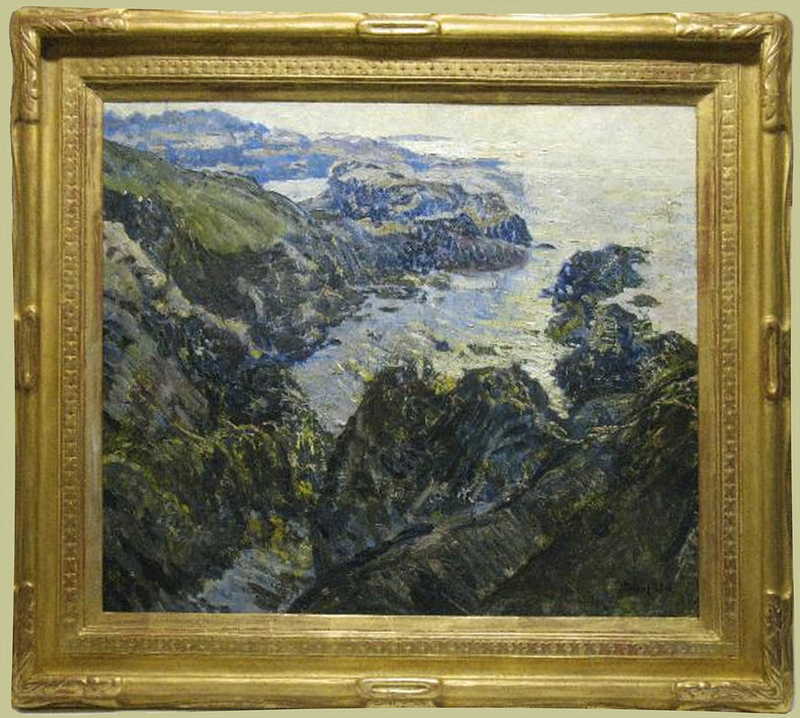 The coast of Cornwall in its Newcomb-Macklin frame gives a flavour of Schofield’s work after his association with Taylor apparently ceased in 1911. 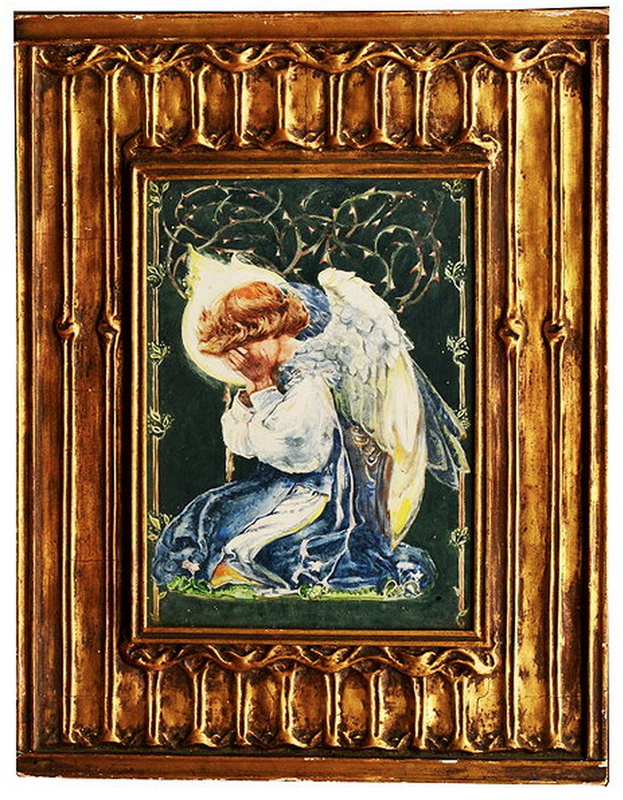 Frames from this Chicago-New York firm (founded in 1871), highly original and a combination of Arts-and-Crafts and Art Nouveau in style, have the same melting qualities to the carved ornament as Schofield was seeking in his correspondence with Taylor, above. Another example of his work in the same Newcomb-Macklin pattern, The lower falls of 1915, shows clearly that he also preferred a certain type of profile. This is notably similar to Taylor’s frames in the arrangement of fluidly-ornamented top edge, cavetto, small running motif and plain sight. Equally, the finish of each frame was chosen individually in all cases to harmonize with the colouring of the picture. Corner details from the Newcomb-Macklin frame of The lower falls, top, and the Taylor frame on The coast of Cornwall, bottom. Newcomb-Macklin Co. to Schofield, 27th November 1911, Reel 5043, W. Elmer Schofield Papers, Archives of American Art, Smithsonian Institution, Washington D.C.
 Schofield to H. W. Taylor, undated draft (August 1905? ), Reel 5043, W. Elmer Schofield Papers, Archives of American Art, Smithsonian Institution, Washington D.C.
 Schofield to Muriel Schofield, 20th November 1909, Reel 5043, W. Elmer Schofield Papers, Archives of American Art, Smithsonian Institution, Washington D.C.
 Winter in Picardy (1907), o/c, 38 ½ x 48 ins, Philadelphia Museum of Art, Gift of Dr & Mrs George Woodward. Purchased from the 103rd Annual Exhibition of the Pennsylvania Academy of the Fine Arts, 4 February-24 March 1908, where it had first been exhibited. The Woodwards already owned one Schofield, Zennor Cove, Coast of Cornwall, purchased in 1904 from the Pennsylvania Academy Annual Exhibition of that year. Schofield to Muriel Schofield, 31st December 1907, Schofield Family Archive. Muriel Schofield to Schofield, 17th October 1905, Reel 5043, W. Elmer Schofield Papers, Archives of American Art, Smithsonian Institution, Washington D.C.
 Muriel Schofield to Schofield, 6th March 1906, Letter No.246, Schofield Family Archives. Montreuil-sur-Mer, the market, 7 3/8 x 9 3/8 ins, oil on canvas board, Fine American and European Paintings, 3 December 2006, Freemans Auctioneers, Philadelphia, PA, lot 144E. Label verso, upper centre block of The landing stage, Boulogne, Cincinnati Art Museum. Love the blog, as always. Wish I could have been there and able to acquire the weeping angel and frame from Mallams. Do you have any idea what was the hammer price? WOOHOO! I just investigated Mallams’ website and discovered the catalogue and results of the recent (July 13, 2015) furniture and works of art auction. Further inspection of the site revealed past catalogues galore! So with deeper digging I could suss the results. Any idea of the auction sale date? WOOHOO! 10 December 2014, sold for 300 pounds! This Yank could have owned it for less than US$500, and that’s hard to imagine. I’m completely out of touch with reality. Sorry to overload your blog with posts, but I’m also hasty and exceedingly exciteable! Well-done, James. Scholarly, well-researched, handsomely illustrated. and entertaining as well. A rare view into the the relationship between artist and framemaker a century ago and into the decisions the artist had to make regarding the exhibition of his work. A fine contribution to the literature. Thank you for such a kind comment; I’ll pass what you say on to the author!